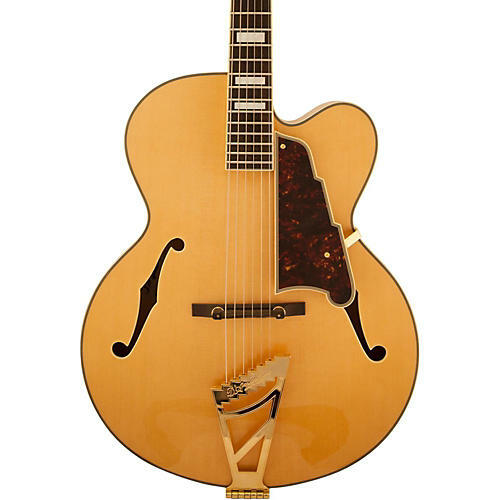 A classic-looking beauty with barebones electronics for a sleek, stylish archtop. Designed to capture the true essence of the instrument, the EXL-1A is a no-frills acoustic arch top with simple plug-and-play so you can bask in its organic tone. It comes with D'Angelico's electro-core trustworthy piezo pickup which has no control knobs because you can trust in this guitar's natural tone. With a 17 in. body and a slim C-shape neck, the EXL-1A is comfortable and exceptionally built, ideal for all types of players -- especially those looking to stand out. With 7-ply binding, a Scalini pickguard, and Grover Super Rotomatic tuners, the legendary D'Angelico aesthetic abounds. Robust in sound when amplified or acoustic, the EXL-1A is an elegant addition to any guitarists' collection. Pick up the phone or click to call today!